To work on a picture means to search the concealed, that what lies beyond the speech. Like the moment closing a book and scaling the read in the hand. So is sculpture. The facts matter less than what it causes in someone. 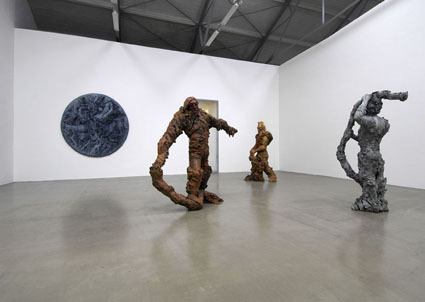 In the exhibition ‚liebe Hölle' I show sculptures from 2007 and 2008. Again it is all about the connection of the archaic and the contemporary and the relation of man and world. Whereas in my earlier sculptures the combination of contrasts was evident, the new works connect to a unique counterpart. Something like the indifferent force and grace of the brutal existence of nature. „We are life in the middle of life that intends to live. ", said Albert Schweitzer. Dear hell. Fortune and hate. The existential questions are always around. Fear makes the beautiful even more valuable. Horror as a catalyzer of fortune. We wish the hell out of life but at the same time we know that it belongs absolute to us.The exhibition shows the larger-than-life bronzes Berserker and the relief sieben 100 Millionen. In medieval Scandinavian sources, the Berserker characterizes someone fighting in a flush that does no longer realize wounds or pain.The title is also a setting. Berserkers are legend and to be a Berserker is reality. After all it is about the demoniac madness guarding in us. About the searching after the state of emergency and busting the borderline. Excessive and ruthless methods on the one hand and the desire for a life without pressure on the other.The term Berserker contains the senseless and the functional rage as well as the ability to give up oneself for something, to fight for something. The force of the total longing and the ability to defeat the fear of death. The sculptures themselves do not want to explain something. They are image. The contrasts collapse. Dear hell. They are question and stoic assurance. Movement and resistance. Material and will. Anarchy and alchemy. The complete calmness. If I would be on the surface of a Pulsar I would weight 113 billion barrels. 113 billion. A number, complete but without framework is like a picture, like art. Its value is not measurable. All time in one point.Someone is spinning around himself composed into the nothing. An old fish is diving unnoticed under his feet. Everywhere there are roots. Everything is disappearing, simmering and appearing again. The unimaginable situation being without any culture and conditioning.Despite of its size the tondo with an aperture of 3.10 meter made of blue-grey acrylic resin is standing in relation to brooches and cameos. Cameos were often made to honor somebody.